Technically, It's Called Washington's Birthday. Have I ever mentioned that we don't really celebrate Valentine's Day in our house? And that a shared love of Lincoln-kitsch was one of the reasons why I ended up meeting my husband? And that our honeymoon was an Abraham-Lincoln-themed roadtrip? And that I sometimes get the urge to get Abe-Lincoln-faced-up and show up randomly at friends' doorsteps? Because all of those things are true. For as long as I've known him, Brian and I have exchanged our declarations of love and affection on the third Monday of February instead of the 14th. 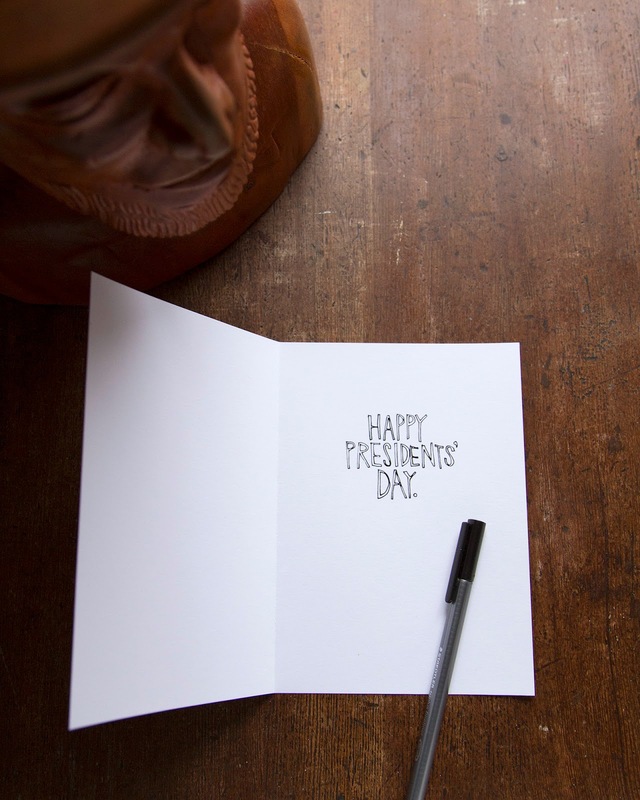 We've always preferred the easy-going, apathetic vibe of Presidents' Day, or, as it is officially labelled by the federal government, "Washington's Birthday". Because who doesn't fondly remember the many filler worksheets of elementary school-- the endless stream of word-searches, scrambles and crosswords that teachers flung at us to escape, if only for a moment, the bleak monotony of February following the Valentine's sugar-rush? I suppose that the answer is: Everyone who isn't American. But 'Murricans, you know what I'm talking about. 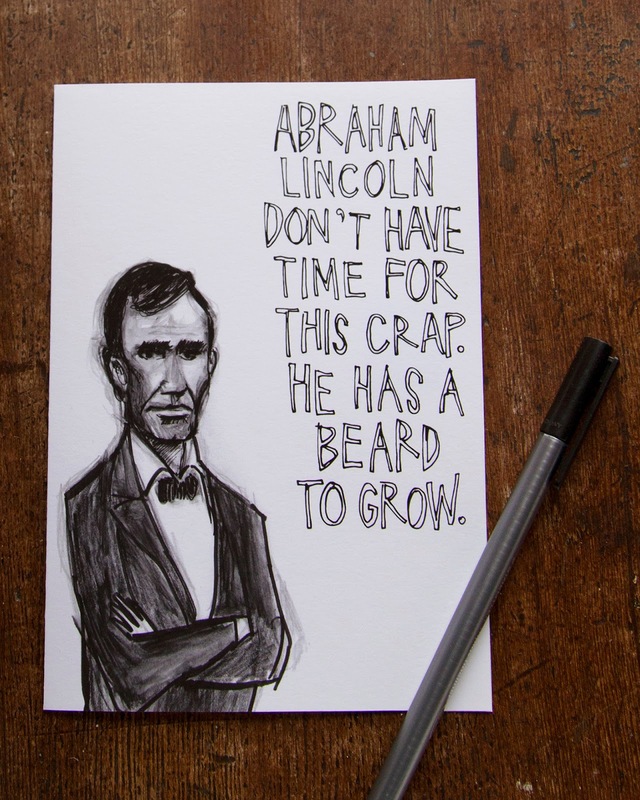 So I've been making silly little Presidents' Day cards for years, and this year I made some for, perhaps, you? 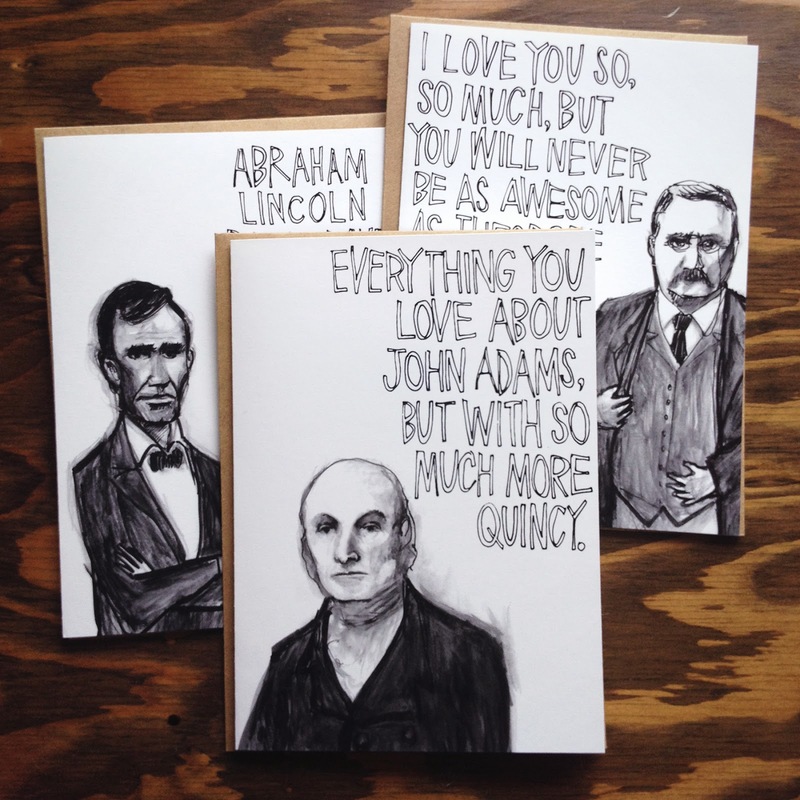 Be they on etsy, but I'm also doing a special on instagram-- 3 cards of your choice for $12 + $2 shipping. 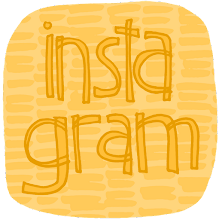 You can purchase them via instagram, I'm @lauren_hunt, or, if you're not "on the 'gram" (that's slang that no one has ever before used), just send me an email (lauren at auntjune dot com) and I'll invoice you via paypal. What what? And yes, that is a hand-carved bust of Abraham Lincoln, made by an African man who had never heard of him before. To our knowledge, we own the only one in the United States, or, at least the first one produced by that particular craftsman. It's a good story, I'll have to tell you later. Abraham Lincoln! 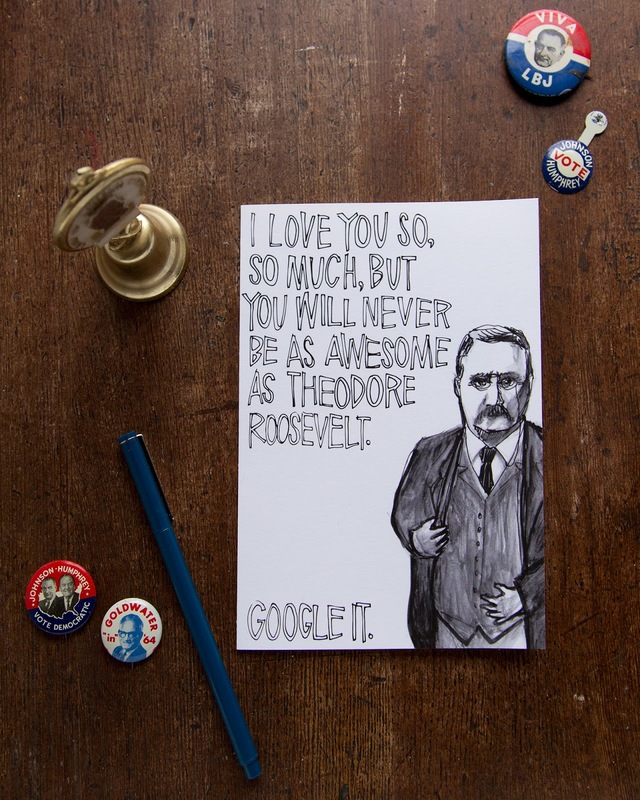 Theodore Roosevelt! 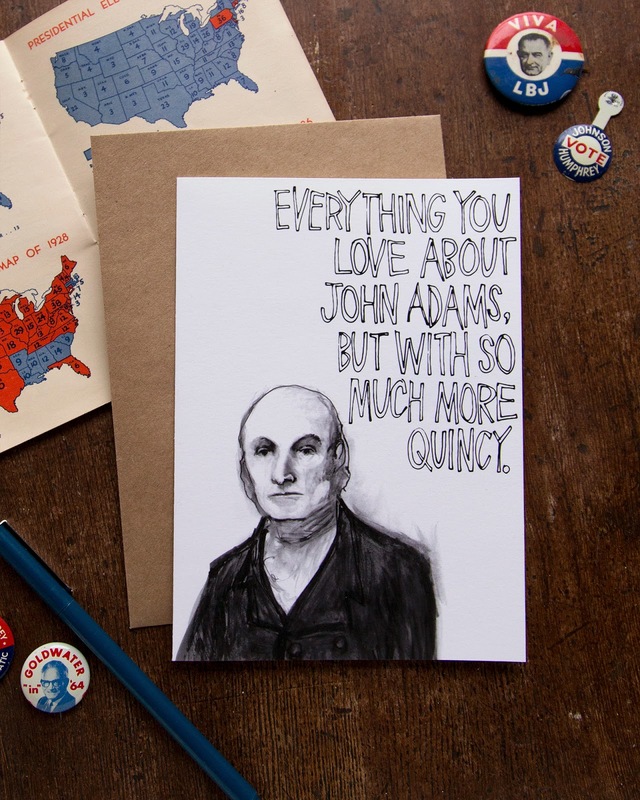 John Quincy Adams! Just go with it!